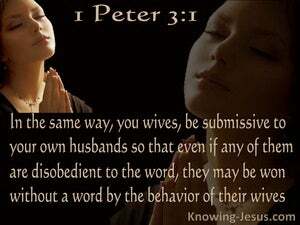 1 Likewise, ye wives, be in subjection to your own husbands; that, if any obey not the word, they also may without the word be won by the conversation of the wives; 2 While they behold your chaste conversation coupled with fear. And Memucan answered before the king and the princes, Vashti the queen hath not done wrong to the king only, but also to all the princes, and to all the people that are in all the provinces of the king Ahasuerus. Let your women keep silence in the churches: for it is not permitted unto them to speak; but they are commanded to be under obedience, as also saith the law.